Come join us at Wapiti Cross Ranch. Cabins for the self guided hunter. Each Unit Sleeps Four (4) and are fully equipped 100% non-smoking with heat, full bath, refrigerator, and microwave. Sleeping area with two (2) full bunks and two (2) twin bunks. Dining table and chairs each with four (4) ft. open porch and ample parking for large trucks or trailers with a large barn. Cabins are located in area 11, close to area 3/301. Shooting area for sighting in. Ample parking. 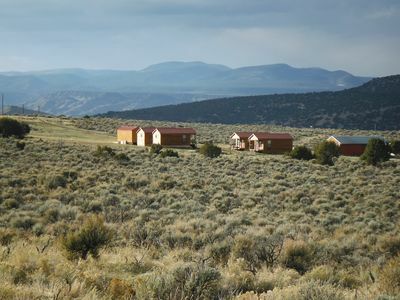 Located in beautiful northwest Colorado and home to one of the largest deer and elk herds in the nation, Wapiti Cross Ranch is situated just 14 miles west of Maybell off US Hwy 40 in Moffat County, placing you right in prime elk country. Backed against the majestic Cross Mountain and miles of public land, the ranch borders some of Colorado’s prime trophy units; giving our guests great chances in seeing trophy class animals. Big game hunting at its finest. Good Mule deer populations, and our accommodations are right in the middle of their playground. Please visit our website for more info and pictures.